WINSTON-SALEM, N.C. (AP) -- No. 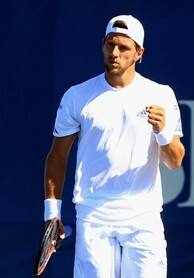 2 seed Jurgen Melzer was upset in the second round of the Winston-Salem Open. Russia's Igor Andreev topped the Austrian 7-5, 6-3 on Monday in the second round of the final men's tuneup before the U.S. Open. Melzer had trouble catching up to Andreev's serves, some of which were clocked at 125 mph. Andreev, who won points on 77 percent of his first serves, is 79th in the ATP rankings and entered 0-2 against top-five opponents this season. Lleyton Hewitt was eliminated in the first round, losing 6-4, 7-6 (3) to Slovenia's Blaz Kavcic in a night match. The 24-year-old Kavcic, who played in a tournament in Uzbekistan over the weekend, didn't arrive in Winston-Salem until 3 a.m. Monday. The 30-year-old Hewitt missed the last five weeks while recovering from a foot injury. He has won 28 career singles titles, including two grand slams. Hewitt said his foot bothered him some, but Kavcic simply played better. Earlier, No. 8 seed Marcos Baghdatis defeated American Ryan Sweeting 7-5, 6-1 in another second-round match. The 16 seeded players, including top-seeded Andy Roddick, received first-round byes. "I was able to find a solution to get by and win. That's the most important thing,'' Baghdatis said. Qualifier Kei Nishikori of Japan beat Luxembourg's Gilles Muller 1-6, 6-4, 7-6 (5) in the first round. Also in the opening round, Israel's Dudi Sela defeated Italy's Filippo Volandri 6-3, 6-2; Belgium's Steve Darcis topped Portugal's Frederico Gil 3-6, 6-3, 6-4; France's Julien Benneteau won a matchup of qualifiers by defeating Brazil's Ricardo Mello 6-1, 6-3; and Argentina's Carlos Berlocq advanced when Austria's Andreas Haider-Maurer retired with Berlocq leading 7-5, 4-1. In other first-round matches, American Michael Russell beat Adrain Mannarino of France, 6-4, 6-7 (3), 6-2; Uzbekistan's Denis Istomin topped Germany's Matthias Bachinger, 7-6 (1), 6-1; and France's Edouard Roger-Vasselin beat Lukas Rosol of the Czech Republic, 7-6 (5), 2-6, 7-6 (4).